Today’s post is new! I am packing for a trip on Thursday where I’ll be visiting my “hometown.” I say “hometown” because I grew up moving all over the world due to my father being in the military for 24 years. I am forever grateful for the experiences that came with my childhood knowing I saw far more than most at an early age, but the word “hometown” still resonates as a funny sounding concept. Anyhow, due to a death in the family, I am returning to Birmingham, Alabama where my family is from. As I prepare for the upcoming trip where I’ll be gone five days I thought it would be fun to share outfits with you all. Packing is both a science and an art. It’s a science in the fact that you have limited space and you want to use all of it appropriately. It’s an art being able to feel and look put together without overloading your suitcase. If you haven’t checked out my page on Packing, I suggest you immediately stop reading and head over there. It’s full of TONS of tips and strategies. I include how to pack in a color scheme, how to pack in a carry on and additional posts on what I actually wore on trips. For this trip I am obviously wearing black for the memorial service so that was a given in the color scheme. I am adding in pieces with pops of red and yellow for accents throughout the trip because black can tend to wash me out. I also added Spring inspired accessories like basket bags, totes, and a patchwork bag! Although the purpose of the trip is to celebrate a lost one’s life, I am looking forward to seeing my extended family for the first time in almost three years! Here’s a breakdown of what I’m wearing. The only items I will additionally pack include two fitness outfits, undergarments, a swimsuit in case the hotel has a pool and finally pajamas. I hope you guys enjoy this round up! If you do, please DM me on Instagram, Twitter, Facebook or leave a comment below! For every flight I want to be as comfortable as possible. Since we are going direct and the flight is short I’m wearing stretchy skinny jeans both there and back. Once you find a soft pair of jeans that have a little stretch you’ll find they aren’t uncomfortable to sit in for a few hours. For longer flights I usually opt for a maxi skirt or a pair of leggings. I usually bring my largest jacket on board for warmth and to save space in my bag. I prefer to wear a pair of slides or ballet flats for security screening but pack in my personal item a pair of warm socks. I like to have layers that I can put on or remove so that I can adjust to the surrounding temperatures. Plane flights can get hot and cold depending on what the air craft needs so being able to easy add a scarf or remove a sweater is a necessity. Finally, I like to look put together when I land so that I am ready to go and don’t have to waste time changing if we aren’t going straight to a hotel. The weather is going to be a little tricky this time of year in Birmingham. If you live in Texas, it’s similar weather to Dallas and Ft. Worth. This time of year it’s warm in the day 60-75 degrees and cool at night. I’m packing an extra daytime outfit so that if I don’t like something, I have options to change. I can also change out a shoe and wear one of the following in the evening if I want to. It’s nice to always pack one additional option for the trip that’s versatile for day or night. Again, I’m mostly wearing neutrals with pops of red or white so things can mix and match if I feel like I want to be a little more creative. Travel Pro Tip: Make sure you try each outfit on BEFORE you pack. For the evenings, the temperatures will drop between 20-30 degrees. I’m taking a trench coat and a suede moto jacket to layer over the dresses or jeans I’m wearing. I packed a few long sleeve dresses which are perfect for Spring to stay both warm and cool and then an evening out wearing jeans. One of the misconceptions about packing is that you need to bring a lot to have options. Not true, by carefully planning out your outfits and bringing neutrals you can have a much bigger variety. I really love navy, so of course, I mixed navy pieces in with my evening looks. It also gives me a little break from black. 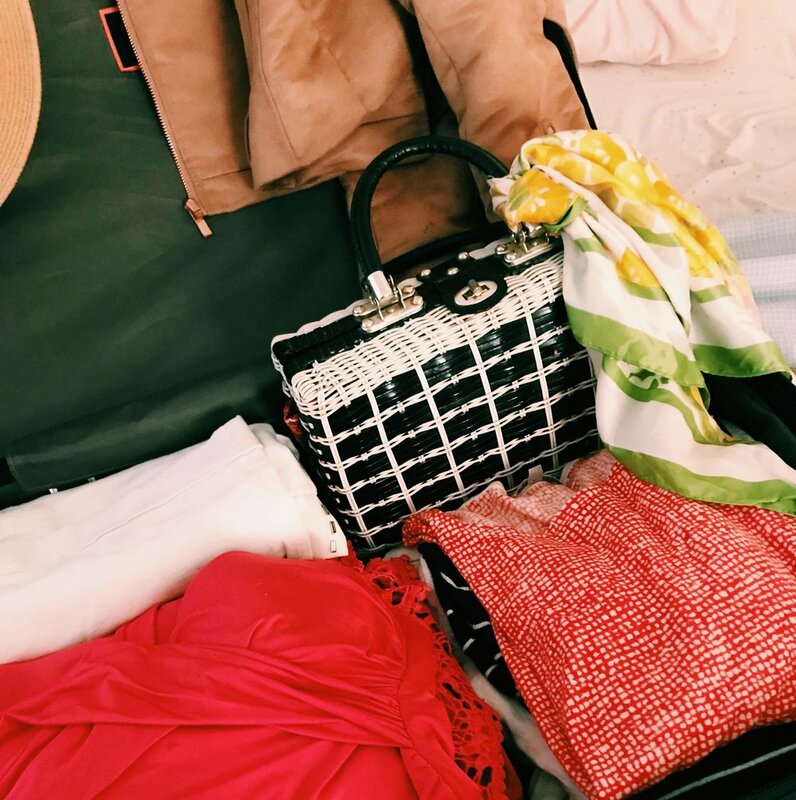 Travel Pro Tip: Dresses are the easiest thing to pack and take up the least amount of room! While I oftentimes pack in a carry on this trip is different. My mother (an amazing woman who has always generously taken care of her entire family) has a disease that has rendered her in the need of a full time caregiver. As my father and I planned the logistics of the trip we decided to make things simple by checking the bags in and just bringing personal items on board. That way, if we need to help mom we are able to without dealing with a bunch of suitcases in the airport. I hope to write an upcoming post on this specific topic. At this point, I have flown with a six week old baby, elderly and toddler so I do have more to share with you on transporting others that need assistance. Once my sister sprained her ankle during a Summer trip home and had to ride with us on a 24 hour trip back to South Korea from Alabama with a removable cast. There are so many ways to make the trip easier and I want to share that information with you guys! What are your packing tips? Although I fly often there’s always something new to learn so leave me a comment! I’m coming at you with something fun today! When I started 5 on Fridays a few months ago I thought it would be a style segment where I round up old outfits for ideas. Well, it’s quick morphed into something more fun! 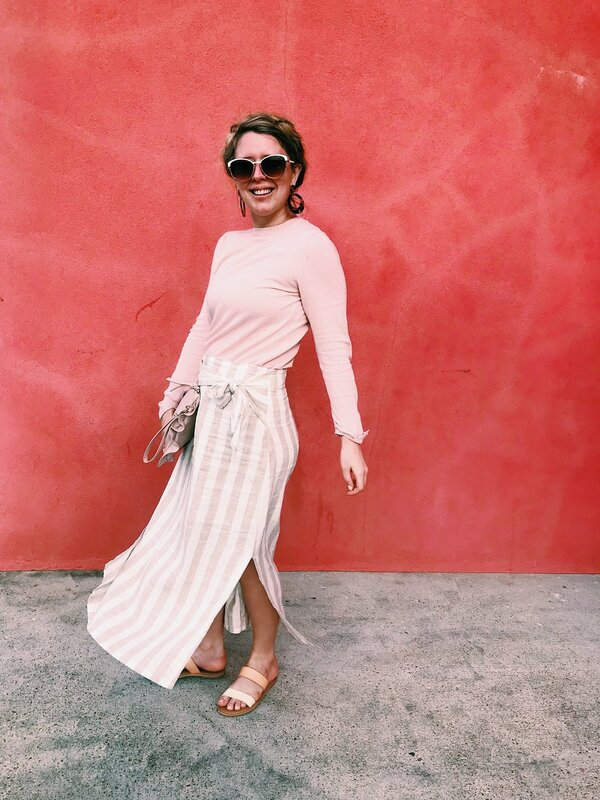 I’m now including topics like travel tips, trips ideas and today’s post is a guide to my outfits during our recent trip to Galveston. I hope you enjoy and find a little vacation Inspiration. The first day I started out with a really classic look. When selecting a palette for this weekend, I decided I wanted soft blush tones mixed with olive, navy and khaki. The goal was to wear stripes as much as possible and also keep the looks classic and feminine. I wore a lovely The Royal Standard dress, a simple Everlane Trench Coat and The Royal Standard slides. I also paired a strawbag with the whole look for a causal embellishment. This lovely Tibi jumpsuit was featured earlier this week on the blog. Although it’s no longer available on line, I found a really similar one for you in the products listed below. I paired it with pretty earrings, a clutch and lovely ballet flats. You can easily throw a wrap around or scarf if you feel too cold. This ensemble was one of my favorites. 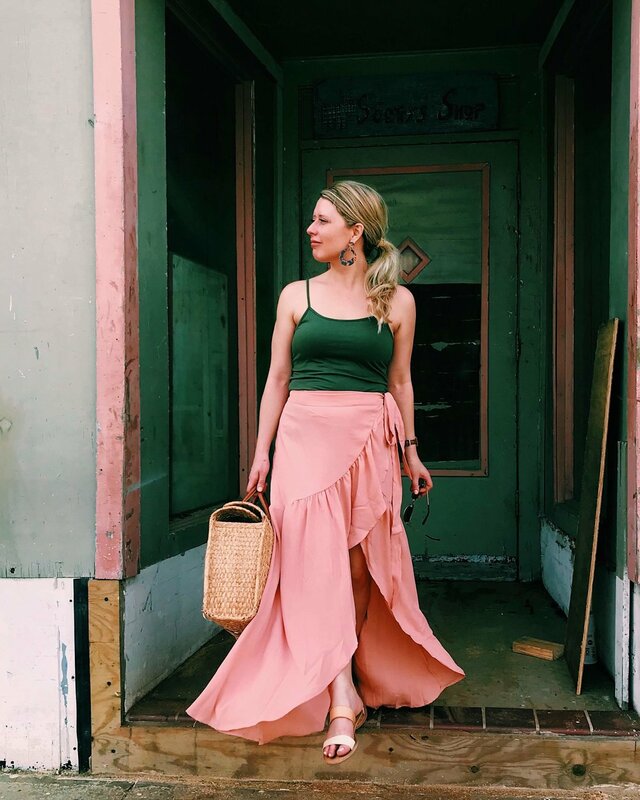 I paired a blush wrap skirt with a simple olive tank top. A neutral flat sandal and picnic blanket bag was awesome for a day at toting around things while we went shopping. I added tortoise shell earrings and wore a pair of gold aviators. I really try to bring something more relaxed in the event we go to a theme park. I told the afternoon to pair a good pair of yoga pants with a relaxed ruffled top. It was cloudy that day, so I kept getting chilly. I added a pair of platform lace sneakers with a simple pink utlitarian bag to keep the whole look relaxed. I wore this look to lunch and then we took the kiddo to the beach to build sand castles afterwards. Since it was mid-March during this trip, it was still a little chilly. I wore a lightweight sweater and striped linen skirt for the day with a pair of two strap sandals and blush clutch. This look is so comfortable and relaxed yet polished at the same time. For the finishing touch I pulled my hair back into a halo braid and then added a pair of earrings. I’ve said it before and I’ll say it again but the first step in good skincare is to drink enough water. Not coffee, not sodas, not juice, straight up water. Try different brands until you find one you like. I’m less picky about my water. Seriously, love drinking the tap water at my home in Cypress but on the road I usually opt for bottled so I know it’s from a clean source. The body is made up of 70% water and we constantly deplete ourselves from movement, weather, and just living. If I have a morning flight I make it a point drink about 33 oz of water starting 12 hours before. Then, when I get through security I either refill an empty bottle or purchase the largest one I can for the flight. Masks give your skin what it needs on a deeper level than your typical routine. 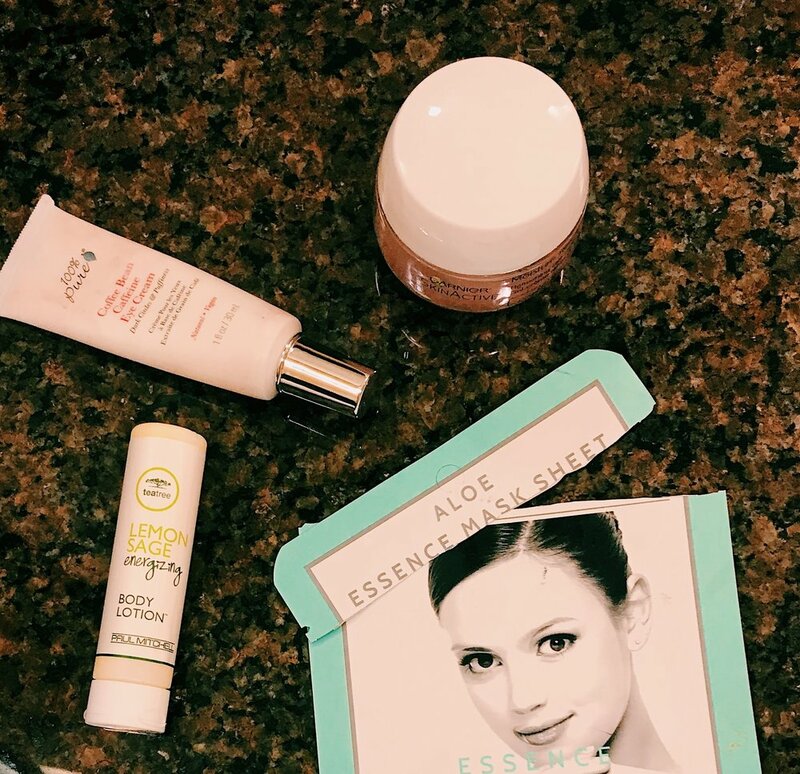 I use a variety of different masks (see this post) 3 or more times a week depending on what my skin needs, but before a flight I’m looking to hydrate. 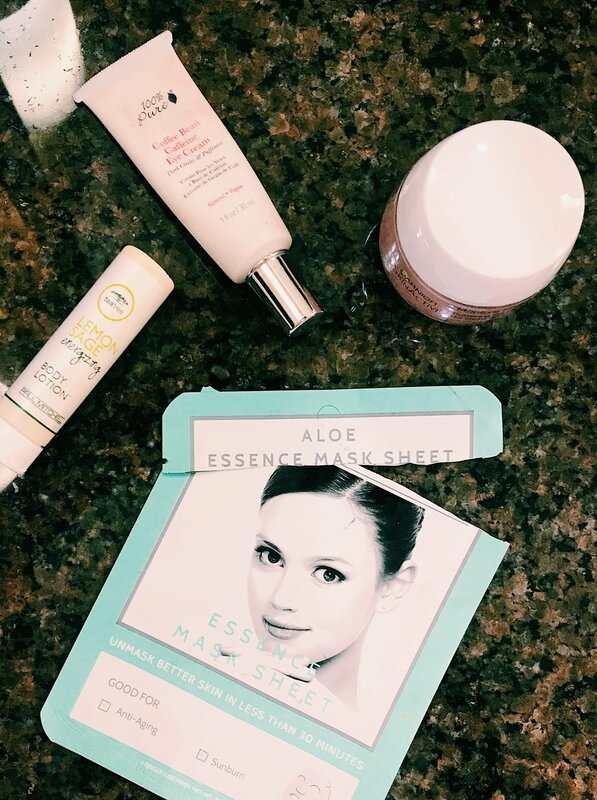 Try a sheet mask to conserve space. I like bringing a couple along with me so I can continue my skincare routine while on the go. The single serving packaging is not only convenient but practical. If you have a mask in a jar you prefer, buy a little container and bring along a sample of it for your trip. It’s easy to forget about the body but after your shower take the time to layer on lotion for your whole body. I usually use the hotel’s lotion selection as long as it doesn’t irritate my skin but if I am looking for major moisturizer this one from Nivea is phenomenal. Especially, if you are going to a tropical climate like Hawaii or the coast. Your body is extra exposed to rays and the heat can take a toll. Before you even leave your hometown make sure you cover every inch of your body and throughout your trip. Who wants to look fatigued at the end of flight when you arrive at your final destination ready to take a new adventure on? Defintely not me! I make sure to be extremely diligent about undereye care to reduce puffiness, dark circles and fatigued eyes. Bring eye drops and an eye treatment. I really like this one from 100% Pure which is non-toxic and cruelty free. You can also use Neutragena’s hydro-boost for extra moisture if you want to grab something from your local drugstore. Both are winners in my opinion. Once you’ve cleansed and applied a hydrating mask then add a moisturizing facial cream or gel to lock in all of those nutrients. Skin tends to produce more bad oils when we don’t moisturize then our pores get clogged. I am now on my second bottle of this cooling gel that feels amazing (even with a sunburn) from Garnier. The best part? It’s such a great value at under $10 a jar. Well, there you have it! Five ways to prepare that skin for less than ideal conditions. Grab your sleeping eye mask and a good chapstick then put those earbuds in to kick back on your flight. Use it as an opportunity to relax before you arrive at your final destination. Do you guys have tricks for keeping your skin looking great during flights? If so, I’d love to hear!